Life's Little Moments May is designed to make a summary of the past school year as we head into summer. As the school year comes to a close, this is a great time to review what your students have learned and milestones that have been made. 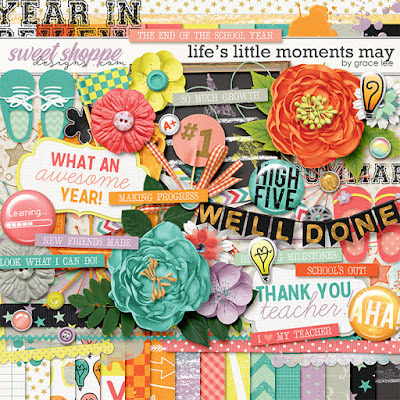 This kit is perfect for teacher appreciation week, graduation, and any other school-themed layouts. and 68 elements. The elements included are: 1 banner, 1 blackboard, 1 bow, 4 brads, 1 branch, 4 buttons, 6 chalk art, 2 flags, 3 flairs, 9 flowers, 3 frames, 2 foliage, 2 lightbulbs, 3 paint, 3 ribbons, 2 ricracs, 2 pairs of shoes, 2 stamps, 4 starbursts, 1 string, and 12 word art.